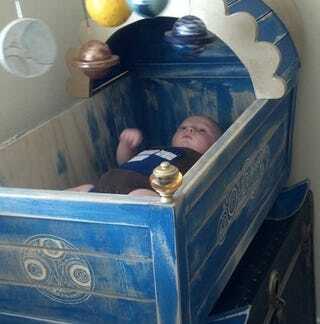 A baby crib fit for a Time Lord! One crafty Whovian has cobbled together The Doctor's crib, which was also Melody's crib, who is really... well you get the picture. The whole Gallifreyan creation is just super adorable. We tip our fez hats to you, Baby Andred Gallafraigh and Kathleen Gallafraigh.